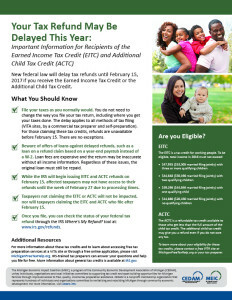 Beginning in 2017, the IRS will hold all refunds containing the Earned Income Tax Credit and/or the Additional Child Tax credit until February 15. If you file before then, you may not receive your refund until the end of the month, so please plan accordingly. For more detailed information, you can download the flyer below by clicking here.